• View topic - Wishing You a Happy birthday sir. Wishing You a Happy birthday sir. First of all wish you a very happy birthday sir, keep inspiring. I am S.A.Prabhaharan currently pursuing mechanical engineering in Chennai sir. Right from my childhood my father keep on motivating me to write civil services exams but i didn't realize it's importance those days. But i understood the real power of it later. Every time when i used to see invincible officers like you , i too dream to have those insignia and emblems in my uniform one day. 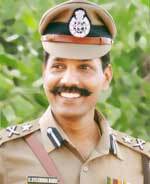 But i had undergone a severe intestinal surgery at my age of 3, will that be a bar for selection in IPS sir ? Thanking you in advance. Re: Wishing You a Happy birthday sir. I am very pleased to know about you and your noble ambition. importance of civil services . IPS is certainly a worthy ambition. Thank you for your valuable reply sir.